Wondering how parathas can be made gluten-free? After all, they are usually made with wheat flour or maida! 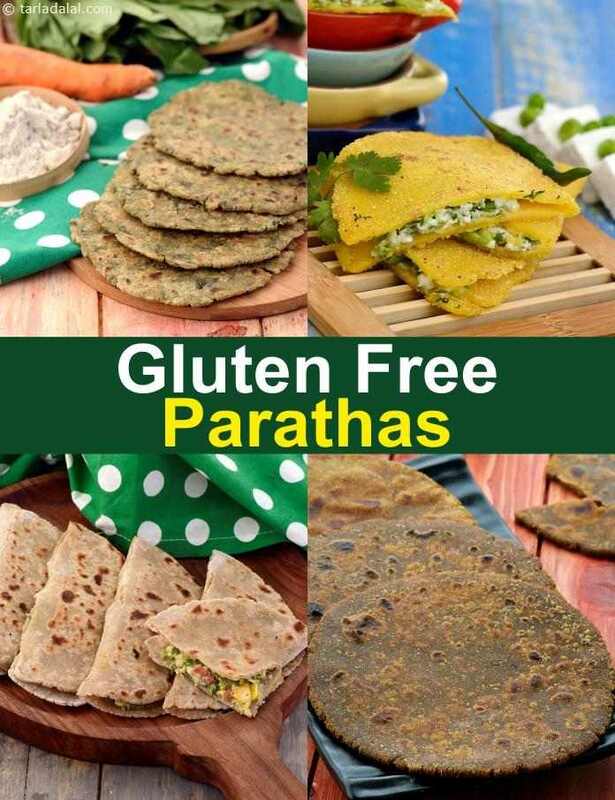 We are all set to surprise with this lip-smacking selection of gluten-free parathas made using ingredients like ragi, jowar etc., which are not only perfect for the gluten-intolerant, but healthy for the whole family! However, remember to avoid using oats due to cross-contamination. Rajgira flour for Gluten Free Paratha (Amaranth/Ramadana flour): It is obtained from Rajgira which is the seed of the Amaranth plant. It is a very rich source of protein, calcium and iron. During fast, Indians make Rajgira Paratha . Buckwheat (Kuttu) flour for Gluten free Paratha: It is called "Kutti-no daro" in Gujarati and "kutto" in most other Indian languages. Buckwheat is high in Protein and Gluten Free which is used to make Suva Buckwheat Paratha. Bajra Flour (Pearl Millet Flour/Black millet flour) for Gluten free Paratha: It is most commonly used in winters and is rich in protein, iron, calcium, folic acid, magnesium and zinc. Try the Bajra Garlic Paratha. The 3 Grain Paratha consists of a combination of Gluten Free Soya Flour, Jowar Flour and Ragi flour making it super healthy and rich in Fibre and Protein. A typically mexican style stuffing adds volume and taste to these buckwheat parathas, which need just a bowl of soup to add up to a filling meal. Buckwheat flour can also be replaced with maize flour in these delicious parathas. Maize flour parathas filled with a combination of paneer and green peas are a wonderful alternative to stuffed whole wheat parathas. Eat the parathas as is or with an accompaniment of your choice.